Haven’t picked up the brush much this week, so I figured I would post another of my older models. Timing is fitting considering I just finished my Mentor Legion Librarians. 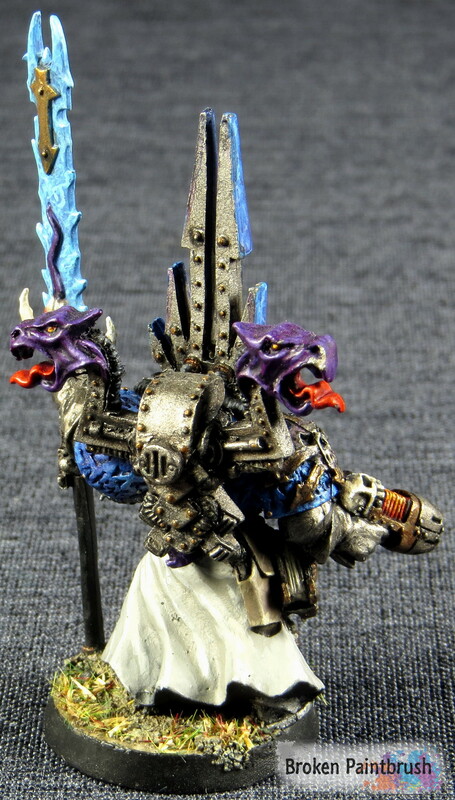 Another classic sculpt, this metal Chaos model painted up as Iron Warriors Sorcerer has been part of my collection for probably 15 years – crap that makes me feel old. Anyway, of all the four chaos deities, Tzeentch has always been my favorite both from a story and model perspective, so it was only fitting that the 14th Grand Company’s representative be of the Great Schemer’s ilk. It also adds a great way to experiment with additional colors in an otherwise drab looking army. I mean, no one picks the Iron Warriors for an army based on the cool, vibrant paint scheme. While I have itched the color bug over the years with the multitude of other armies, I always come back to my original favorite. Its also fun to come back to this classic sculpts as a reminder of how fantastic we have it now. Not only do we not need to worry about the whole piece falling apart when it dents our floors, but the details and poses have come so far in the last decade. Have any of you ever broke out a classic and given it new life?